Gregory M. Noonan joined The Corry Law Firm, P.A. on September 1, 2009 as an associate attorney and became a partner in 2014. Mr. Noonan’s law practice is concentrated in the core areas of the firm representing plaintiffs in personal injury and wrongful death matters. Mr. Noonan was born and raised near Albany, New York and moved to Florida in 2001 to attend college on a golf scholarship. 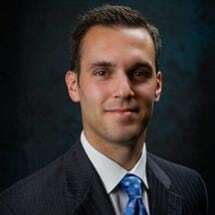 He received his bachelor’s degree from Eckerd College in St. Petersburg, Florida in 2005 and his law degree from Florida State University College of Law in 2008. Prior to joining The Corry Law Firm, Mr. Noonan practiced law in a Tallahassee based law firm where his law practice was concentrated in general civil litigation and criminal defense. While in law school, Mr. Noonan served as a representative for the Student Bar Association, and was also a board member on the inaugural Florida Bar Student Division Board of Governors. In 2013 Mr. Noonan was the recipient of the Tallahassee Bar Association's Tom Ervin, Jr. Most Distinguished Young Lawyer Award. In 2014 Mr. Noonan was named to The National Trial Lawyers – Top 100 Trial Lawyers for civil plaintiffs’ work. Mr. Noonan served on the Board of Governors for the Young Lawyers Division of the Florida Bar from 2011-2012. Mr. Noonan currently serves as Treasurer-Elect on the Board of Governors for the Tallahassee Bar Association and as Immediate Past President of the Capital City Justice Association. He is also a Fellow of the Florida Bar Foundation, an Eagle member of the Florida Justice Association and a member of the American Inns of Court. Mr. Noonan is admitted to the Florida Bar and the U.S. District Court - Northern District of Florida. He is and his wife, Megan, live in Tallahassee with their two sons.